The alumni award for Entrepreneurship was awarded to Samuel Gosselin (EMBA ‘07). Two years ago, after a successful corporate career, he decided to give it all up and embark on a new journey, opening his own French restaurant, Josephine, named after his mother, in Boston. ”I’ve run companies in the past but I always wanted to create by own business and be my own boss,” Samuel was quoted in Boston Magazine. Samuel attributes his success as a restaurateur to his passion, hard work and comfort and acceptance with the risk level in the industry. He cites being able to use all elements of his knowledge and experience, including that gained from his life experiences and the Drexel EMBA program. He also indicated that the ability to de-construct the company to address key operating elements and his willingness to do all that is required contribute to his success. LeBow Executive Education benefactor, alumnus and trustee emeritus George F. Krall joined the holiday reception. He traveled with the EMBA students on a number of international residencies and has many friends among the alumni. Executive MBA alumni are delighted when they have a chance to reconnect with Krall at social and continuing education events. 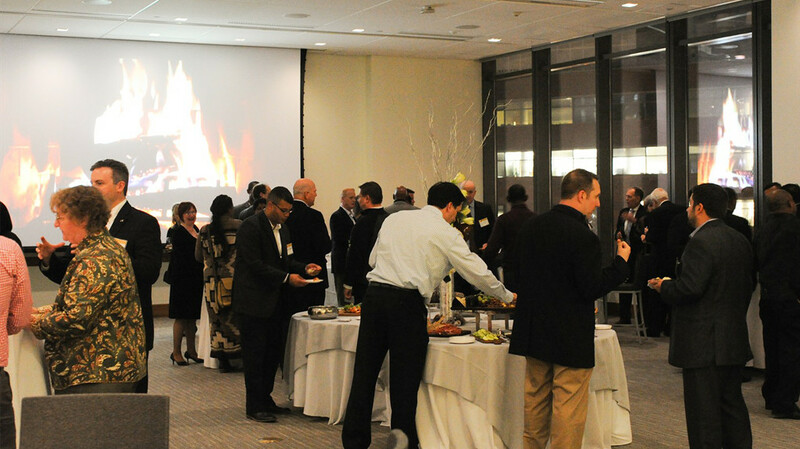 The EMBA Winter Holiday Reception is a tradition that alumni look forward to each year as a way to stay connected with each other and remain engaged with Drexel and LeBow. Our best EMBA students are those referred by our loyal alumni. The EMBA Alumni Awards are sponsored by the EMBA Alumni Board. Learn more about the 2015 EMBA Award Recipients. LeBow College of Business will award four honorary degrees at its 2014 commencement. H. Adam Holt received the 2017 EMBA Alumni Award for Entrepreneurship. The Executive MBA community meets regularly and stays connected through social, networking and continuing education programs for current EMBA students and fellow alumni. This year’s annual Executive MBA alumni awards were presented to Justin Ettelson and Samuel Gosselin.